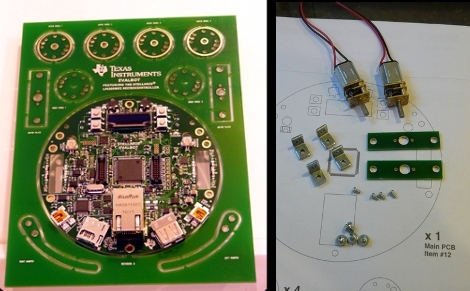 [Chris Muncy] just received his EvalBot from TI and took some pictures of the assembly process. He was one of the lucky folks that picked up the kit for just $25 using a short-lived coupon code. Seeing the kit makes us wish we had ordered one. There is some assembly required but as you can see, it’s pretty much just mechanical assembly of the wheels and the front bumper arms. We think the wheel design is quite good. It consists of two small gearhead motors mounted on the rectangular PCB parts that you can see on the right portion of the image above. Those mount to the circular mainboard using metal L brackets. The wheels themselves are three circular pieces of PCB, one with a smaller diameter sandwiched in between its two larger cousins. This creates a channel that is perfect for a neoprene O-ring to give the wheel traction. The main board uses an optical sensors and a hole through all three parts to function as a rotation counter. It’s a fancy piece of hardware and we can’t wait to see what you can do with it! If you’ve got one, we want to hear about your adventures. Can’t wait ’til mine arrives! Someone needs to follow up with a ‘How-to’ getting started on programming this thing for those of us still stuck in the AVR dark ages. Those of you interested in a place to discuss these boards in more detail, http://ti-evalbot.proboards.com/index.cgi is a good place to start. i’m still waiting for mine to ship. Hopefully I’ll get mine soon. I managed to spend over 40 minutes dealing with TI’s craptastic fulfillment site and finally got it to accept the order with the coupon code. But then my eZ430-433 Chronos took A YEAR to be shipped to me. Make sure the wheel holes really really line up. Robbed? Pololu was the first company to ever make a robot kit that looks like this? If you think that then you’re either trolling or severely misinformed. @MadHatter, what are you talking about? It’s cool how most of the bot is just printed circuit board, like the chassis, wheels, and bumpers. Got mine yesterday. Listen to his advice on clamping the wheels — I need to redo mine because they separated enough to angle and cause flat spots, bottoming the robot out. Can’t wait to get it running! I ordered one of these babies about a minute ago, the coupon still works. Anyone know a name on that list I could try? My buddy and me ordered ours about the same time when that short lived deal was available. Both of ours are listed as 12/21 for the expected ship date. Just finished building. The wheels are HARD to put together and get right. The wheels really don’t stick out past the batteries that far. It gets caught up on the gout lines between tiles in my kitchen. Would be nice if they added cliff sensors and/or line following sensor to the board. Would make for a nice desk toy as I figure out how to program this thing. Mine was also scheduled to arrive 12/21, yet I received it yesterday, so it could be sooner! It’s nice to hear I might not have to wait till Christmas to get mine. I’m still a little worried this will be a mess to get working with using only OSS, but at least I might not need to wait too long to find out. Has anybody found the schematics for this board? From my research it looks like a demo-board for the MicroCOS 3 operating system, and you’re suppose to buy the book to get the schematics. As for programming it, I plan to use Keil (not free), it supports Cortex targets and Luminary Micro chips. All I need now is the schematics.. anyone have those? @NatureTM – same here, I actually got a phone call the other day from Micrium asking whether I wanted to buy any of their RTOS software. Interesting to know that they’re ringing up people who bought the boards – has anyone else had this happen? Some of us can afford to buy robots and beer. It seems like it’s easier to use google to find TI documentation than to actually try to find it on TI’s site. I like their products, but not their website/support. Thanks for the info. My order is 5965. I dont mind waiting because it was a great deal but it would be cool to get it sooner. I kind of figure they just delayed a LOT of the orders to December 21st and then that way people will be happy if it arrives earlier. They did get a LOT of orders that day. Got mine two days ago to the UK – with no customs charges! From what I have read I have one of the lowest order numbers. My order just got f*cking cancelled. Minut points of TI, a whole truckload of them. Did you order it after they said it was a mistake and they were going to cancel orders? Please note: ESC Boston attendees received a special coupon for a highly discounted EVALBOT. As of October 11th, we have re-enabled use of the ESC Boston coupon code and extended the expiration date of the coupon code by 1 week. Please be aware that use of the code will be validated against the ESC Boston attendee list. Use of the coupon code will result in approximately a 24-hour delay before firm confirmation of your order; coupon code uses for non-ESC Boston attendees will be canceled. Either way, approximately 24 hours after your order, you will receive an email either confirming your order with a firm delivery date, or informing you that your order has been canceled. If your order is canceled, your credit card will not be charged. Well.. my order hasn’t been cancelled, but i haven’t received any mail after the order either..
I’ve never seen anything like that, buying a product for a certain price, and afterwards augmenting the price?? The PR guy’s over at Ti are sleaping or just terribly bad in what tey do…. The coupon code was intended for ESC Boston attendees, but we are honoring orders that were confirmed before an update/clarification about the coupon code was posted on TI’s estore. As many experienced, there were issues with TI’s estore due to the volume of orders, but we’ve worked aggressively to address those issues. As some have reported, some orders have shipped. We have an email confirming orders and providing your order’s anticipated ship date that was supposed to have gone out to those of you with confirmed orders; from your comments, it appears that email hasn’t yet gone out. Be looking for it. The enthusiasm around EVALBOT is awesome, and we can’t wait to see where you take the technology. It’s clear to us that we need to keep providing these types of easy-to-use, fun tools along with ways to salute your innovation. Stay tuned! If anyone could help me get started with programming, that would be awesome. I just received mine and I didn’t expect it to come with zero documentation. The documentation you require can be downloaded from here which also includes where to get the software. Just got mine today. Looks like they are still coming. Word to the wise: scrape out the inside of the inner wheel piece before attempting to insert the motor shaft. I clumsily knocked off my wire motors and had to solder them back on. Andrew, same happened to me. Those wires aren’t held on all that well. Just got mine yesterday (Finland) and I placed my order in may or something, so yeah, it takes “a while”.